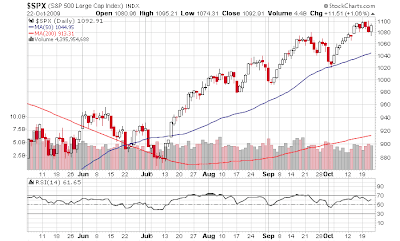 On Wednesday there was a new high followed by a close at the low of the day on the S&P. This is a sign of an interim top. Sometimes there can be a weak minor new high after, but over the course of weeks we are going down on the basis of this one signal. Other signals are already in place on momentum, and valuation has been in a warning zone for a while (high but can go higher). Yesterday's market action of up 1% net on the day, finishing just under the high of the day, did not negate the call of an interim top. Yesterday also had a lower opening than the previous day's close and the close (and intraday high) were some way below the previous day's high of the day.